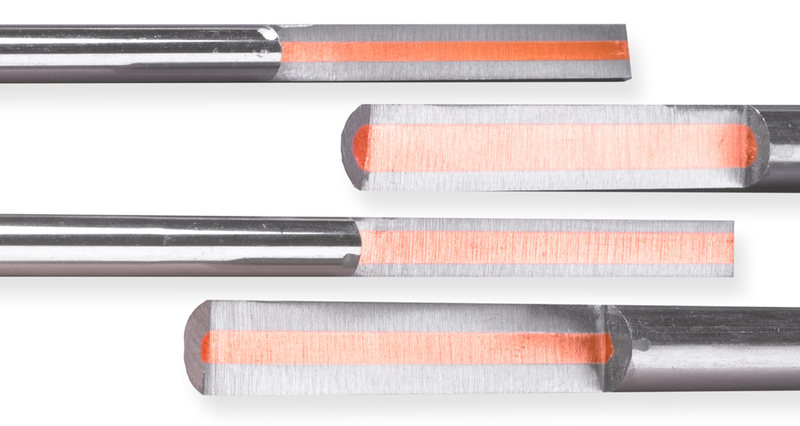 As a leader in the production of high-technology clad-metal products, Anomet applies this technology to the production of copper cored glass sealing alloys. These glass-to-metal sealing (GTMS) alloys result in a high quality product with uniform hermetic sealing characteristics capable of carrying up to six times more current than the same size solid wire. Complete Metallurgical Bond Provides complete hermetic sealing between the metals, excellent mechanical strength, ductility and greater reliability. Copper Core Permits simple electrical connections and greater conductivity which allows a smaller conductor than solid for the same power requirements. Custom Processing & Other Alloys Temper, surface finish, and packaging may all be customized to your specific requirements. Other glass sealing alloys are available on request. *Other glass sealing alloys are available on request. Ratio 2:1 and 3:1 (Alloy to Copper) standard. Other ratios available on special request. Packaging Coils can be supplied in any size up to 150 lbs. They can be supplied on spools, reels, or wrapped coils. Temper Any customer specified temper available. Note: Because the Copper Cored/Clad composite inherently is not fully reversable, accurate theoretical calculations are impossible. Therefore, these values are only approximate and are offered only as a guideline. *Other alloys also available. Copper Cored Hastelloy® is also available. Hastelloy® B2, Hastelloy® C276, Cu Cored Hastelloy®, Hastelloy Clad Copper. ®Hastelloy is a registered trademark of Haynes International.